Republic PAKISTANIA is a nation led by President MURTAZA on the continent of Asia. Republic PAKISTANIA's government is a Parliamentary Democracy with very conservative social policies. Economically, Republic PAKISTANIA favors moderate policies. The official currency of Republic PAKISTANIA is the Pakistani Rupee. At 258 days old, Republic PAKISTANIA is an old nation. 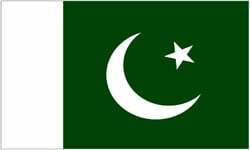 Republic PAKISTANIA has a population of 1,197,432 and a land area of 23,050.00 sq. miles. This gives it a national average population density of 51.95. Pollution in the nation is almost non-existent. The citizens' faith in the government is at an all-time high with an approval rating of 100%. 04/20 05:27 pm - PAKISTANIA left the alliance Arrgh. 04/20 04:06 am - PAKISTANIA had war declared by Aqualand for the reason of "Swizzle, Counter". 04/20 03:58 am - PAKISTANIA had war declared by Galateia for the reason of "You attack on Swizzle, so counter". 04/20 03:55 am - PAKISTANIA had war declared by Sonic Blast for the reason of "Counter for Swizzle". 04/19 08:36 pm - The embargo on PAKISTANIA placed by Nation of Keeglandia has ended. 04/19 06:45 pm - PAKISTANIA declared war on germantown for the reason of "war typhoon!!! 20 mil for peace". 04/18 04:50 pm - PAKISTANIA declared war on Indianatonia for the reason of "war typhoon!!! inactive raid pm for peace". 04/18 11:21 am - PAKISTANIA declared war on The Great White Fleet for the reason of "war typhoon!!! 3 mil to peace". 04/17 07:08 pm - PAKISTANIA declared war on Swizzle for the reason of "war typhoon!!! inactive raid pm for peace". 04/17 06:35 am - PAKISTANIA declared war on IUIC for the reason of "Remember the deal? before 25th". 04/17 06:24 am - PAKISTANIA declared war on Murandy for the reason of "war typhoon!!! inactive raid pm for peace". 04/16 07:55 am - PAKISTANIA had war declared by Georgian empire for the reason of "You brought this on yourself". 04/16 02:12 am - PAKISTANIA had war declared by Silverdell for the reason of "Welcome to Orbis.". 04/16 12:19 am - PAKISTANIA had war declared by Turtalia for the reason of "I have been instructed to attack you.". 04/15 06:09 pm - PAKISTANIA declared war on Swedgeland for the reason of "I like free rss. msg for contributing your shares to me". 04/15 04:51 pm - PAKISTANIA declared war on Ridia for the reason of "war typhoon!!! inactive raid pm for peace". 04/15 02:17 pm - PAKISTANIA had war declared by Gad kingdom for the reason of "Counter for OFA". 04/15 05:02 am - PAKISTANIA changed their Color Trade Bloc from Gray to Black. 04/15 03:42 am - PAKISTANIA declared war on Yashingrad for the reason of "war typhoon!! !40 mil for peace". 04/14 03:43 am - PAKISTANIA declared war on Prince of power for the reason of "war typhoon!!! inactive raid pm for peace". 04/13 05:10 pm - PAKISTANIA changed their Color Trade Bloc from Gray to Black. 04/13 05:04 pm - PAKISTANIA declared war on Anderlands for the reason of "war typhoon!!! inactive raid pm for peace". 04/12 02:53 pm - PAKISTANIA had war declared by Patriot Imperium for the reason of "Pantheon Counter". 04/12 08:53 am - PAKISTANIA had war declared by Sautekh-Dynastie for the reason of "Pantheon Counter". 04/12 05:36 am - PAKISTANIA had war declared by The Germany for the reason of "Pantheon Counter". 04/12 04:16 am - PAKISTANIA declared war on Trump Nation for the reason of "war typhoon!!! inactive raid pm for peace". 04/12 03:36 am - PAKISTANIA declared war on Jorlandia for the reason of "war typhoon!!! inactive raid pm for peace". 04/11 05:26 pm - PAKISTANIA declared war on Tallplace for the reason of "I'm a merc, nothing personal". 04/11 01:37 pm - PAKISTANIA declared war on The Mystic Orthodox Order for the reason of "war typhoon!!! inactive raid pm for peace". 04/11 07:38 am - founded a new city, GUJRANWALA.